FLOYD MAYWEATHER: "MARQUEZ IS NEVER GOING TO GET THE BENEFIT OF THE DOUBT"
"I was at the club. I had a party in Virginia. I got some text messages and some emails about the fight Saturday night though. I didn't watch the fight, but from what I'm hearing, Marquez got cheated...I truly feel that Marquez is never going to get the benefit of the doubt. I want to congrautlate Marquez and I want to congratulate Manny Pacquiao for doing it a third time, but I just feel like if you get it done right the first time, there's no need for a second or third fight, and if it is needed, do it again in the same fasion and in the same way, or do it even better...when I faced Marquez, I was two years off just traveling and vacationing. I took two years off, no working out, no other activities. I went into training camp and then the fight had got pushed back because I had an injury, so that pushed it back a little bit more, but I still went out there and performed and looked marvelous," stated undefeated pound-for-pound champion Floyd Mayweather, who shared his thoughts on the reports he got about Manny Pacquiao's controversial majority decision victory over Juan Manuel Marquez this past Saturday. Although he didn't watch the fight, Mayweather was informed via email and text message of the outcome and the performance of both fighters. You don't want to miss what he had to say. Check it out! FM: How's it going Ben? BT: You know, I can't complain, at least not as much as Marquez can about losing another controversial decision to Pacquiao. I know you didn't get a chance to watch the fight. FM: I didn't. I was at the club. I had a party in Virginia. I got some text messages and some emails about the fight last night though. I didn't watch the fight, but from what I'm hearing, Marquez got cheated. Win, lose or draw, whoever I fight still has to be tested with random blood and urine tests. BT: From what you've heard, do you have any comment on Pacquiao's performance? FM: I can't really say nothing about him because there's been a defamation of character case filed against me. In the past, I was able to criticize my opponents and talk trash in a playful manner, but I guess, you know, with me talking trash to Manny Pacquiao, I got a lawsuit. I mean, Ali's done it and a lot of the other top fighters have done it. Fighters, we do it back and forth to each other. I mean, the fight could've happened the way it happened because, you know, someone is slowly changing so they can prepare to fight me. They know they're going to have to take the random blood and the random urine tests. BT: So you think there's a chance that they may actually want to fight you next? FM: What I don't really understand is, I know Manny Pacquiao can't really speak much because he don't really understand English, but he may know a few words because he do live in the States from time to time, so...I personally think it's Bob Arum having a vendetta. I think he's very very upset with me because, you know, I exposed and I opened the world's eyes up to different things. I never officially came out and said that I believe Manny Pacquiao is on steroids or that I believe he's on enhancement drugs; I never came out and said that he actually is. I only stated my opinion on what I believe in. BT: Well after the fight, Bob Arum was talking more about a 4th fight with Marquez than he was about a fight with you. FM: Why? I mean, I truly feel that Marquez is never going to get the benefit of the doubt. I want to congrautlate Marquez and I want to congratulate Manny Pacquiao for doing it a third time, but I just feel like if you get it done right the first time, there's no need for a second or third fight, and if it is needed, do it again in the same fasion and in the same way, or do it even better. People fail to realize, when I faced Marquez, I was two years off just traveling and vacationing. I took two years off, no working out, no other activities. I went into training camp and then the fight had got pushed back because I had an injury, so that pushed it back a little bit more, but I still went out there and performed and looked marvelous. 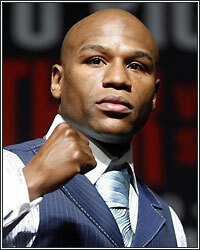 If I fight a guy and I don't knock him out, they say, "Well, Mayweather didn't knock him out." If I knock him out in the late rounds, they say, "Well, what took so long?" If I knock him out in the early rounds, they say, "Well, you can always catch a guy cold." Like I said before, I'm always in a no-win situation. If I fight a guy that's my age, they're going to say, "You know what? He's over the hill." When I fought Marquez, they said Marquez was over the hill. Remember, when I fought Marquez, I think he was 36 and I was 32. Now, two years later, Pacquiao is 32 and Marquez is 38. BT: They also said Marquez was too small for you. I know you didn't get a chance to see it, but Saturday night, on HBO's unofficial scales, Pacquiao weighed in at 148 pounds while Marquez weighed in at 150 pounds. He was actually 2 pounds heavier than him. FM: I mean, like I said before, I never accused Pacquiao of nothing, but I think I'm entitled to my own opinion. I just had an opinion. I didn't say, "I know you doing this" or "I know you doing that." I said some jokes in the past, had fun, doing it smiling, and we talked about it, but if I was or wasn't joking, it's just my opinion. I'm entitled to my own opinion. People have said things about me, and wrote and criticized me about things in the past, but it goes in one ear and out the other. A lot of times, I don't hear about it because, like I said before, I don't read it if it's negative. If it's positive, then they know to bring it to me. BT: After the fight, Freddie Roach said that Marquez has given Pacquiao problems three times now and he has to do a better job of dealing with counter-punchers, but in the past, he's suggested that you would be an easy fight for them because they have you figured out. Do you think there's a reason why Roach would make such contradictory statements considering that most people say you're the best counter-puncher in the sport. FM: I'm not going to say nothing about Freddie Roach. He's battling Parkinson's Disease, so I don't want to say nothing bad about him. If he says something about me, they're gonna be like, "Oh, Freddie Roach is chewing Floyd Mayweather out," but if I say something about him, they're gonna be like, "Why is he talking about a guy that has a disease." The only thing I can do is wish Freddie Roach nothing but the best with all of his fighters and I'm going to continue to do what I do. Freddie Roach has faced me before and he came up on the short end of the stick. Like I always say, a trainer can't get in there and fight for a fighter. I mean, it ain't no different for me. A trainer can train you, but you have to go out there and execute the game plan and that's something that I'm able to do.